Going on holidays this summer season? STO Property Maintenance Group give you our top tips on how to protect your home while on holidays. This may seem like a no brainer; however, a surprising amount of homes are robbed each summer season due to home owners’ failure to lock doors and windows. Make sure you close and lock all doors and windows, including cat flaps and doggy doors. A top tip is to place rods of dowel in the window and door tracks to avoid the unwanted prying of your windows or sliding doors. If you have an alarm system, make sure you arm it, as this can automatically alert the neighbours and police of a break in. If you do not have an alarm system, make sure you have one installed. They are worth the investment and give much needed peace of mind. If your alarm system is connected to a security company, contact them and tell them you are away so that any alarm triggers can be promptly checked out. A good tool to give the appearance that someone is still living at home while on holiday is to purchase and install automatic timers for your lamps. You can set these to automatically turn on selected lamps at a certain time each day. Another option is to set the timer on your television to turn on each night, so that it will generate some noise and light to scare away any unwanted intruders. Safety screens are a great way to keep intruders out, they can be installed on the outside of all windows and doors. There are many window protection options available and these days you can install attractive, streamlined screens that do not look like bars or cages, while still preventing burglars from accessing your home. Often the best way to prevent break ins is to get to know your neighbours. If you take the time to make friends with your neighbours, it is easy to ask them to check on your house while you are away, or even just to keep an ear or eye out for intruders. Depending on how long you are away, it can be helpful to have a friend or relative spend some time at your house. They can water the plants, bring in the mail and make it appear as though somebody is still at home. 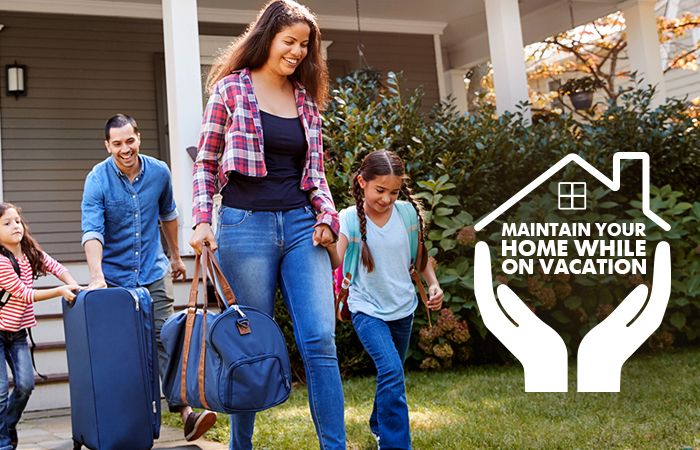 Keeping your lawn and garden maintenance up while you are travelling can help preserve the appearance that someone is still living at your house. This will help to deter burglars from entering your property. Having your mail redirected is a great idea, as it prevents mail from building up in your mail box, which is a key giveaway to burglars that no one is at home. You can have your mail redirected to a post office box or a friend or family address. You should try setting up an answering machine if you still have a home phone, as this will prevent your phone from ringing out and giving clues to burglars that no one is home. In this day and age, it is commonplace to post about your latest holiday on social media, however this can be a huge mistake. Although you think that only your friends have access to your social media profiles, this is not the case. Any number of people can gain access and even a casual discussion by one of your friends about your trip away with an unseemly character can lead to unwanted intruders. We recommend changing your profiles to private and ensuring that any address details or photos identifying where you live are not on your social media profiles. Maybe consider posting about your trip once you have returned. The above are STO Property Maintenance Group’s top 10 tips for securing your home while on holiday this summer. If you make use of our tips above, you will ensure that your property is not left vulnerable this holiday season. If you require any property maintenance services or security devices installed, contact our professional team today. We service the Gold Coast, Sunshine Coast and Brisbane.